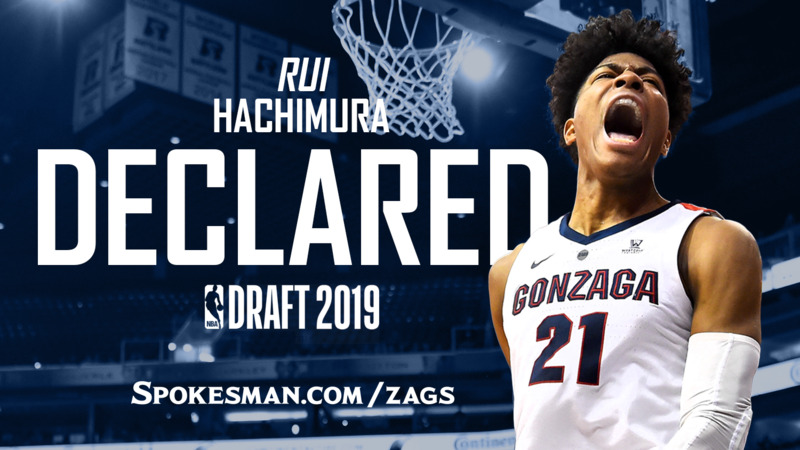 UPDATED: Mon., April 15, 2019, 6:33 p.m.
Rui Hachimura is leaving Gonzaga. His next stop is making history. Hachimura announced Monday he has declared for the NBA Draft. He’ll almost certainly become the first Japanese-born player selected when the draft convenes June 20 at the Barclays Center in Brooklyn. Hachimura’s decision wasn’t a surprise. Numerous mock drafts project the junior forward as a first-round selection, often as a lottery pick. A few list him in the 16-21 range. It’s been a remarkable journey for Hachimura, dating back to his first exposure to basketball in middle school in Toyama, Japan, through his three seasons as a Zag. He arrived in Spokane barely able to communicate in English and leaves as an All-American and one of the most popular players in program history. Hachimura is extremely popular in Japan after helping the national team qualify for the 2019 World Cup and the 2020 Olympics in Tokyo. Japanese media have covered most of Hachimura’s games over the last two seasons. His popularity would skyrocket in his homeland should he hear his name called in the lottery. Hachimura, who missed considerable practice time early on at Gonzaga while he studied English, saw limited minutes as a freshman. He became a significant contributor as a sophomore and elevated his game as a junior, leading the Zags in scoring (19.7 points) and hitting game-deciding baskets against Duke and Washington. “His attitude, character and amazing work ethic have put him in position to do some special things,” said assistant coach Tommy Lloyd, who recruited Hachimura and has brought numerous international players to Gonzaga. “I’ve always told Rui that he’s a pioneer. Hachimura, 21, seems prepared for what’s coming up, which likely includes numerous NBA workouts and attending the NBA Draft Combine next month in Chicago. His 6-foot-8 frame – Lloyd insists he’s 6-9 – combined with his strength and athleticism make him an intriguing prospect. One of the few knocks on Hachimura has been perimeter shooting, but he made 41.7% in a limited sample size of 36 3-point attempts this season. NBAdraft.net projects Hachimura, who has a 7-2 wingspan, at No. 4 to Chicago while Sportingnews.com has him going 11th to Charlotte. SI.com lists Hachimura at No. 14 and he’s No. 18 in ESPN’s Top 100. “That’s the great unknown,” said Lloyd, when asked if Hachimura is ready for the next level. “I think it almost always is for most players. A lot of it depends on what type of situation he ends up in. Lloyd said he’s proud of Gonzaga and various departments within the university working “together seamlessly to help put Rui in this position. Hachimura and teammate Brandon Clarke were named to the 10-player Wooden Award All-America team. Hachimura was selected WCC and District IX player of the year. He won the Julius Erving Award, presented to college basketball’s top small forward, last Friday in Los Angeles. Hachimura’s departure leaves a large hole in Gonzaga’s frontcourt that could grow larger as Gonzaga followers await the decisions of junior forwards Clarke and Killian Tillie. They haven’t announced if they’ll return for their senior seasons or enter their names in the draft. Filip Petrusev showed his scoring ability in limited minutes as a freshman. The Zags have an impressive incoming recruiting class with forwards Drew Timme, Pavel Zakharov, Oumar Ballo and Anton Watson, the Gonzaga Prep product who could play wing or forward. Hachimura has reportedly lined up an agent. Under the new rules, that doesn’t necessarily end Hachimura’s college career – players can opt to return if they cut ties with their agent by May 29 – but those close to the program have no doubt Hachimura has played his last game in a Zag uniform. Published: April 15, 2019, 12:17 p.m. Updated: April 15, 2019, 6:33 p.m.